Earn AICI CEUs right from your home office! AICI is excited to bring you unique AICI CEU Webinar Programs. Access the On Demand Webinars here. 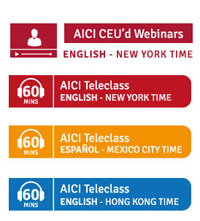 AICI also provides FREE 60 minute Teleclasses. If you are interested in a Teleclass topic, but do not see it scheduled when you can attend, check AICI’s Teleclass recordings to listen at your convenience. If you are interested in a class, but do not see it scheduled when you can attend, please contact the AICI CEU Provider for further information.